If you want to look like a real bingo pro then you need to know your bingo lingo! These fancy phrases are used in halls all over the country and online, so let’s find out all about them. There are so many hosted rooms on this site for you to play in, with some lovely chat hosts too. Play for free in their newbie room to try them out. 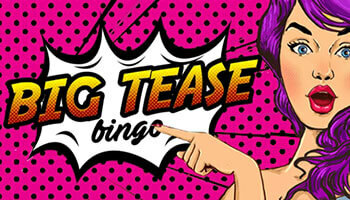 With 2 hours of free bingo each day, this site is one of the best to try chatting on. The cosy atmosphere of this site means that you can always gossip with the other roomies. If you like a party then this is the bingo site for you, as it’s all about celebrating each and every bingo here. Remember to look into the terms and conditions of these offers before you claim. Bingo calls originated out of necessity, as it was hard to hear the callers before sound systems were used. Bingo halls were often really noisy places too, which could make it hard to hear exactly what the caller was saying. Instead, they made up a language of rhyming slang for each number, so that players would be less likely to get mixed up with other numbers. 30 – “Speed Limit” – This was the speed limit in miles per hour of most built up areas in the UK. 44 – “All the Fours” – The only number in 90 ball bingo with two instances of the number four. 88 – “Two Fat Ladies” – The number itself resembles two larger ladies standing side by side. 90 – “Top of the Shop” – The biggest number in 90 ball bingo. Everything changes with popular culture and bingo lingo UK is no different. In an effort to make bingo cool again, many operators have tried to bring in some younger references to their games. Numbers like Oceans Eleven (11), Gareth Gates (8) and Jimmy Choo (32) have been added into the lingo. These are more relevant than some of the older terms like Danny La Rue and Dirty Gertie, which don’t mean much to younger players! It’s just the natural progression of the language, as we’re always finding new terms added into our dictionary. In a year, approximately 500 new words are added to the dictionary, so it makes sense that this would apply to bingo too. WTG Way to go A congratulations for a winning player. GL Good luck Wishing everyone in the room good luck for the next game. BLNG Better luck next game A condolence for not winning this game and good wishes for the next one. GG Gotta go The player is logging off for the moment. SYS See you soon Often used as an alternative to just saying goodbye. JJ Just joking Used to point out a joke, alternative to LOL. COI Come on in Usually said by chat hosts to welcome you into a room. There you have it, now that you know how to sound like a seasoned bingo player it’s time to become one! Play at one of our chosen bingo sites and make your way to the chat room to start flexing those fingers. You’ll find bingo is much easier and more fun when you do! Enjoy up to 500 free spins on top slot games @ Lucky Cow Bingo!